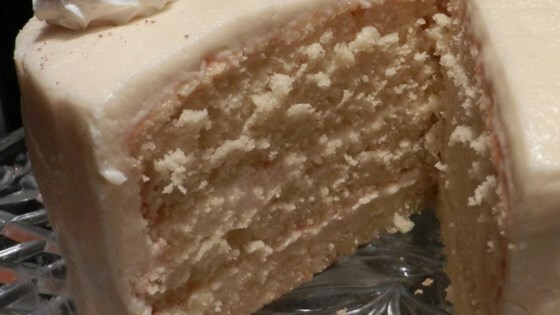 "You can really taste the eggnog in this lovely, rich, moist cake. No eggnog? No problem. You can make enough for the recipe in a jiffy. Nothing says Southern hospitality like this impressive cake. If you like, set aside and tint 1/4 cup of the frosting to your desired shade for decorating the top." Preheat oven to 350 degrees F (175 degrees C). Grease and flour two 9-inch round baking pans. Beat 1/2 cup butter and 1 1/4 cups sugar with an electric mixer in a large bowl until light and fluffy. Mixture should be noticeably lighter in color. Add eggs, one at a time, allowing each egg to blend into butter mixture before adding the next. Stir in 1 teaspoon vanilla extract and 1/4 teaspoon lemon peel, mixing well. Combine 2 cups flour, baking powder, and 1 teaspoon salt in a bowl. Pour flour mixture into the batter alternately with 1 cup eggnog, mixing until just incorporated. Stir in bourbon. Divide batter evenly between prepared pans. Bake in preheated oven until cake springs back when touched lightly with a fingertip or a toothpick inserted in the centers comes out clean, 30 to 35 minutes (test both cake layers). Cool in pans for 10 minutes before inverting on a wire rack to cool completely. To make frosting, combine 1/4 cup flour and 1/4 teaspoon salt in a saucepan. Gradually whisk in 1 1/2 cups eggnog, whisking until smooth. Bring to a boil over medium heat, stirring frequently. When mixture boils, cook for 2 minutes, whisking constantly, until thickened. Remove from heat and let cool completely to room temperature. Beat 1 cup butter and 1 1/2 cups sugar in a bowl until light and fluffy. Mix in cooled eggnog mixture, 1 1/2 teaspoon vanilla extract, rum extract, and 1/8 teaspoon grated lemon peel. Beat on high speed until mixture is fully incorporated and frosting is fluffy. Spread cake with plain frosting between cake layers, over the top and on the sides. Coat the sides with toasted pecans, pressing the nuts onto sides in small handfuls. Refrigerate until serving time. You can substitute dark rum for the bourbon, if you prefer. Pulse 2 eggs in a blender. Add 2 tablespoons white sugar, 1 1/2 cup milk, 1 cup heavy whipping cream, and a dash each of vanilla and rum extracts. Blend until smooth. This is a very good recipe. I also left out the pecans then I added nutmeg and cinnamon to the icing. It was a Big hit. This is one recipe that I will use again. Thanks for sharing! love this recipe cause it was tasty and not too sweet! Loved it! My favorite holiday dessert! I will try a finer sugar for the frosting next time.